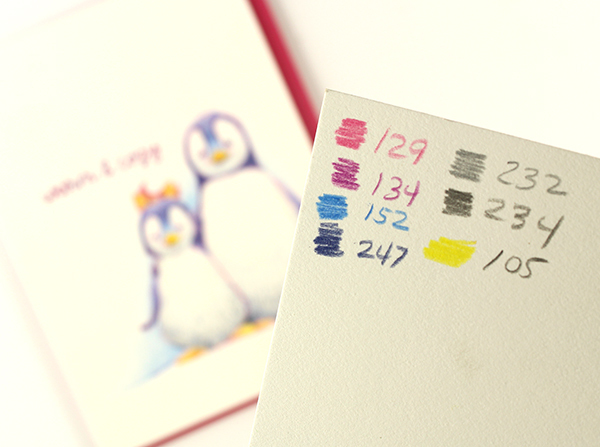 This little pair of penguins are good for SO many seasons of cards. Of course for Christmas. But how about a loveydovey card for Valentine’s Day too? Put a balloon in a flipper and it’s a birthday card! Especially if you color with crazy fun colors like I did here! Watch the video below or click HERE to see it in HD on YouTube. The colors used…..though I encourage you to play with all sorts of fun colors! Students in Colored Pencil Jumpstart should pull out a testing chart and see what might work! Don’t forget that putting down pencil THEN erasing can have some interesting effects! Welcome to the wonderful world of penguin lovers! We’ve been waiting for you 🙂 I love how soft and cuddly they look with pencils! I was thinking they would make great anniversary or wedding cards, or with love from Mom and Dad or from us to you. Filled with charm, Sandy! 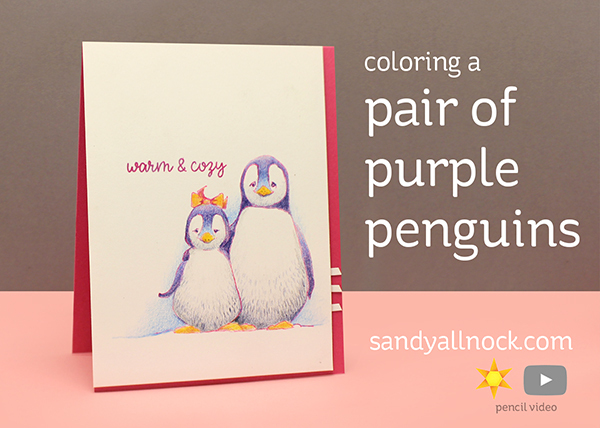 I love your little purple penguin pair. 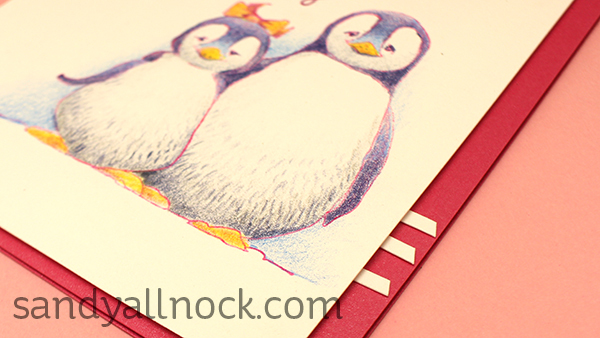 This pinguin pair is so adorable and I love that you didn’t colour them plain black and white. Thank you for this lovely card and colouring tips Sandy. Well-done Sandy! Oh how I would love to have the talent you have in your little finger!!! Thanks for inspiring us to think unique colors!